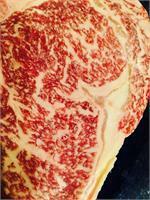 A fantastic variety of all the premium cuts of Wagyu Beef steaks, and 12 of our famous Wagyu Burgers. 2 - Fillet 5 oz. ea. 2 - Wagyu Ribeye steaks 16 oz. ea. $40.00 Off normal retail prices. Holiday Wagyu Beef Steak, Roast and Burger Bundle, 3 Strips, 3 Ribeye, 3 fillets, 1 Chuck Roast, 4 lbs. Ground Beef, 12 Burgers $40.00 off retail prices! Price: $316.12 - $25 Off Retail! A Wonderfull assortment of our finest Wagyu steaks, Roast and custom ground Wagyu Beef Burger. Please note any orders placed after 2:30 pm central time may not ship until next business day. Since orders are perishable shipments cannot be in transit over a weekend or non business day.